Welcome to musson.com.au and thank you for shopping with us. These Terms and Conditions govern the use of www.musson.com.au ("the website") and the purchase of any goods from it. The website is owned and operated by Musson Jewellers (ABN 67 001 749 202). 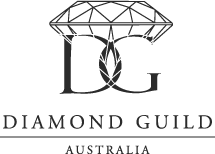 Should you have any questions, please contact Musson Jewellers on +61 2 9412 0888 prior to ordering from this website. Please note that by accessing, using or browsing this website you agree to be bound by its terms, conditions, disclaimers and limitations of liability ("Terms and Conditions"). Musson reserves the right to amend or update such terms, conditions, disclaimers and limitations of liability at any time without providing notice to you. By using the website, you acknowledge that you have read and understood these Terms and Conditions. We want you to be able to order from musson.com.au with total confidence. As such we have created a secure transaction environment. Our On-line Ordering System uses SSL (Secure Socket Layer) technology - the industry standard for encryption technology. SSL encrypts all information including your credit card and all personal information passed from you to musson.com.au Encryption provides you with security and peace of mind when your browser and local network supports the use of encrypted data transmissions. Musson.com.au utilises the Stripe digital certificate to achieve this. All prices quoted in the website are in Australian dollars. Prices quoted are correct at time of printing but are subject to change without notice. The information contained on the website is provided by Musson Jewellers in good faith. To the best of Musson Jeweller’s knowledge, the information is accurate and current. However, Musson Jewellers and its related bodies corporate, any of their directors, officers, employees or consultants do not make any representation or warranty as to the accuracy or completeness of the information. To the fullest extent permitted by applicable law, Musson Jewellers disclaims all representations and warranties, express or implied, including but not limited to implied warranties of merchantability and fitness for a particular purpose and non-infringement. Musson Jewellers makes no warranty that this website, any information or ideas contained on this website or any products or services will meet your requirements. You expressly acknowledge and agree that Musson Jewellers does not control other users of this website, the providers of information or ideas to this website or the suppliers of goods and services purchased from this website, and Musson Jewellers is therefore not liable for their opinions or their behaviour, including any information or advice provided by them or any defamatory statements made by them or any offensive conduct on their part. You further acknowledge and agree that, subject to the section dealing with "Limitation of Liability", Musson Jewellers will not be liable to you or any other person for any direct, indirect, incidental, special, consequential or exemplary damages, including but not limited to damages for product liability, personal injury or negligence resulting from use of goods or services supplied to you, or on behalf of you, through the website. We believe that we have aligned ourselves with excellent delivery partners, but there may be times when, despite their best efforts, parcels are delayed in the delivery process. We will always endeavour to work with our delivery partners to ensure prompt arrival of your gifts. Copyright in the musson.com.au website is property of musson.com.au. Material on this website also comprises copyright material, trademarks and registered trademarks which are the property of musson.com.au and third parties. 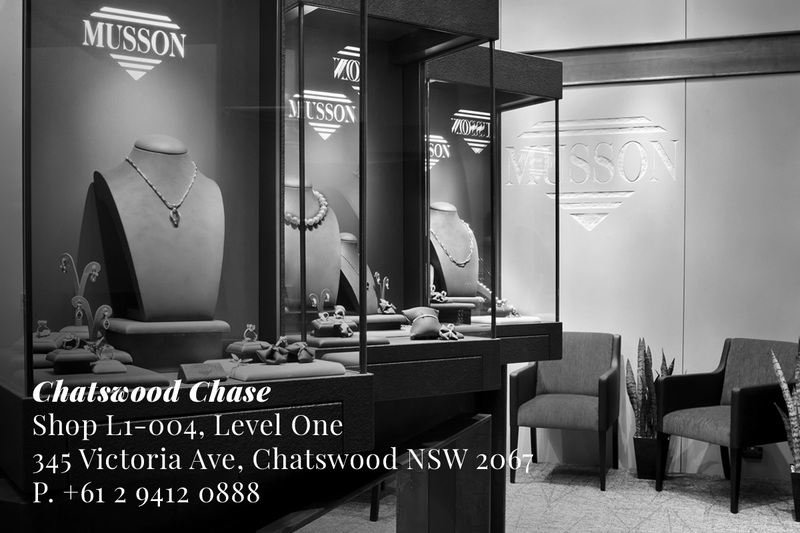 This property may only be used for the purposes of browsing the musson.com.au website and acquiring goods and services of Musson Jewellers. Musson Jewellers is the owner of all copyright subsisting in this website. All Musson designed jewellery depicted in this website is subject to copyright. Prices of goods and services and delivery and other charges displayed on the musson.com.au website are current at the time of display. These prices are subject to variation without notice. All orders are subject to availability. We will do our very best to supply you with your ordered item. Please note, on occasion items may not be available. In this instance, we will be in touch and offer you a replacement, provide you with a time-frame as to the availability of the item, or provide you with a refund for the unavailable item. Orders will not be dispatched until payment in full has been received and musson.com.au is satisfied with the integrity of the order. Without limiting the operation of any other Terms and Conditions herein, musson.com.au is not responsible for any loss or damage caused by late delivery or cancellation of an order or a product. Placement of an order by you constitutes an offer to enter into an agreement with us ("your offer"). We will email you an Order Confirmation for the sole purpose of confirming the details of your offer. Please note that our Order Confirmation does not constitute an acceptance of your offer or reflect the status of your order in any way. If you need to cancel an order, please contact us immediately on +61 2 94120 0888. Our agreement with you only comes into existence once we have both confirmed your order and your payment has been processed. Once we have accepted payment for an order, cancellation of the order is within our sole discretion. Orders that cannot be cancelled will be subject to our terms, conditions and policies relating to Returns and Exchanges (below). You may return or exchange your order within 14 days of delivery upon presentation of your original receipt. You must first confirm your return or exchange with our customer service team prior to returning your item quoting your order reference number (please refer to your order confirmation e-mail); the item's you are returning or cancelling; and the reason for return or exchange. The item's being returned must be in a saleable condition. Once confirmed with our customer service team, item's can be returned to the below address. All returns must be within 14 days of purchase for a full refund or credit note to the full purchase price amount. We will provide you with an estimated date for delivery of all parcels. While we make every effort to deliver by this time, all dates specified are estimates only. We have aligned ourselves with courier partners who we believe will always do their best to deliver gifts by the estimated delivery date. It is the responsibility of the customer to inform Musson Jewellers if an order does not arrive. Once we learn an order has not arrived by the due date, we will lodge enquiries with the courier to ensure delivery occurs as soon as possible. We will not be held liable for any loss or damage resulting from late delivery. Please note that if an item has been lost in transit, we will not dispatch a replacement item immediately. Replacement items will be dispatched according to our discretion. As a guide only, our couriers attempt to deliver to business addresses between 9am and 5pm, Monday to Friday. Unfortunately, we are unable give a guaranteed time of delivery. All deliveries require the ‘recipient to sign for delivery’. This includes, but is not limited to, a hotel or office receptionist signing on receipt of delivery at the specified address. Without limiting the operation of any other Terms and Conditions herein, we will not accept liability for any loss or damage arising from a late delivery. Without limiting the operation of any other Terms and Conditions herein, you agree that late delivery does not constitute a failure of our agreement, and does not entitle you to cancellation of an order. Without limiting the operation of any other Terms and Conditions herein, we will not accept liability for any loss or damage arising from items lost, stolen or damaged after delivery has taken place. Gift certificates and credit notes are valid from three years from the date of purchase and are redeemable in store. Gift vouchers and credit notes are not redeemable for cash. If you would like to utilise a Musson gift voucher or credit note for an online purchase at musson.com.au, please contact our customer service team directly about your purchase. Our customer service team are available Monday to Friday, 9:30am to 5pm AEST on email: info@musson.com.au. 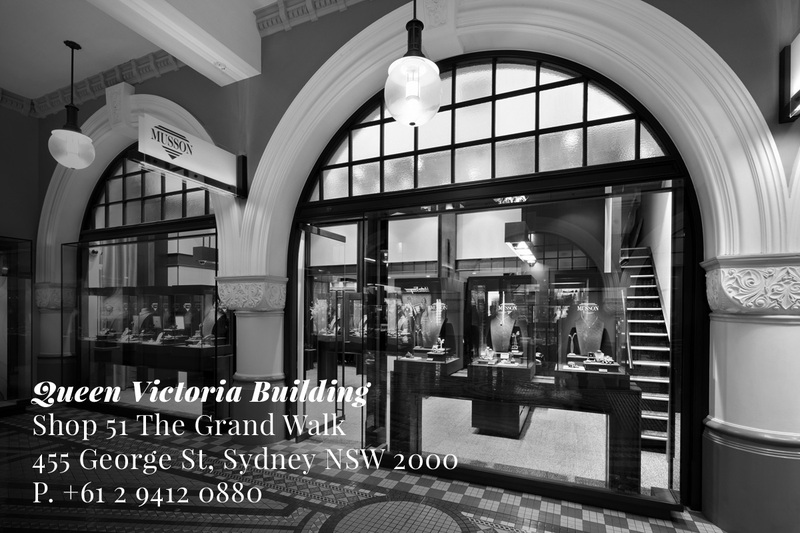 or phone: +61 2 9412 0888. Other Terms and Conditions not listed herein and applying to musson.com.au promotions and competitions are incorporated into these terms and conditions. Unless expressly stated, to the extent that the other Terms and Conditions are not incompatible with the Terms and Conditions herein, the other Terms and Conditions will be in addition to the terms & conditions herein. To the extent that the other Terms and Conditions are incompatible with the Terms and Conditions herein, the other Terms and Conditions shall prevail. Should you object to any of these Terms and Conditions (including any subsequent amendments), you must immediately discontinue using this website. You agree to waive any and all claims that you now have or may have in the future against Musson Jewellers which relate to or are incidental to any transaction. You agree to indemnify and hold Musson Jewellers harmless from and against any and all claims, loss or expense that may be incurred by Musson Jewellers which relate to or are incidental to the performance of its duties as described in these Terms and Conditions including all costs of defending itself against a claim by any other person and/or as a result of you taking any action or refraining from taking any action or instituting or defending any action or legal proceeding. You further agree to indemnify and hold Musson Jewellers harmless from any claim made by any third party due to or arising out of your use of this website, the violation of these Terms and Conditions by you, or the infringement by you, or other users of this website using your membership account, of any intellectual property or other right of any person or entity. A musson.com.au member may not have more than one active membership, whether this is by use of name, email address, an alias or combination thereof. If you breach this condition, you may be liable for the recovery of any benefits obtained this way, such as gift vouchers, promotional benefits and the value therein. Membership accounts are non-transferable. You may update, edit or terminate your membership account at any time. You agree to maintain and update the information as supplied by yourself to ensure accuracy at all times. As a musson.com.au member, you are responsible for maintaining the confidentiality of your own membership account and password. You agree to take responsibility for all activities that occur under your membership account and password. If you purchase goods and services from musson.com.au or create a membership account with us, we may require you to provide your name, address, email address, credit card number or other details ("customer information"). We may subsequently require further details to enable the processing of any orders that you make. You agree to provide musson.com.au with current, complete and accurate customer information when asked to do so by the website or an employee of Musson Jewellers. All care is taken to ensure that musson.com.au websites and data transmissions are free from viruses. However, it is your responsibility to scan any such data for viruses.